MODBUS TCP is an open industry standard widely spread due to its ease of use. It is a request response protocol and offers services specified by function codes. MODBUS TCP combines the MODBUS RTU with standard Ethernet and universal networking standard TCP. It is an application-layer messaging protocol, positioned at level 7 of the OSI model. 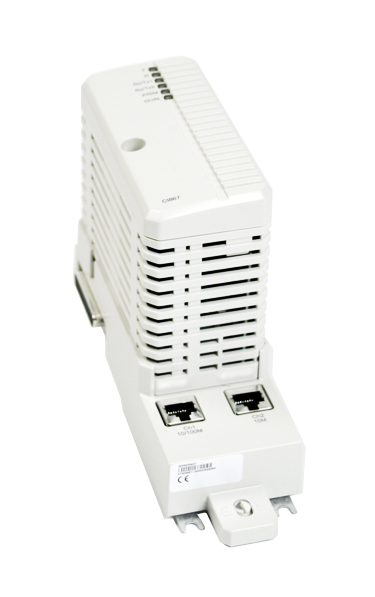 The CI867/TP867 is used for connection between an AC 800M controller and external Ethernet devices using Modbus TCP protocol. The CI867 expansion unit contains the CEX-Bus logic, a communication unit and a DC/DC converter that supplies appropriate voltages from the +24 V supply via the CEX-Bus. The Ethernet cable must be connected to the main network through an Ethernet switch. The CI867 can be set redundant and supports hot swap. CI867 is a dual channel Ethernet unit; Ch1 supports full duplex with 100 Mbps speed and Ch2 supports half duplex with 10 Mbps speed. Both master and slave functionality are supported. A maximum of 70 slave and 8 master units per CI867 (on Ch1 and Ch2 together) can be used.